White Lodge Soleil is a lovely buckskin coloured goat, with frosted ears and a white spot on his head and tail. He also has a white spot under his belly. He has brown eyes and is polled, which means that he is born without horns. 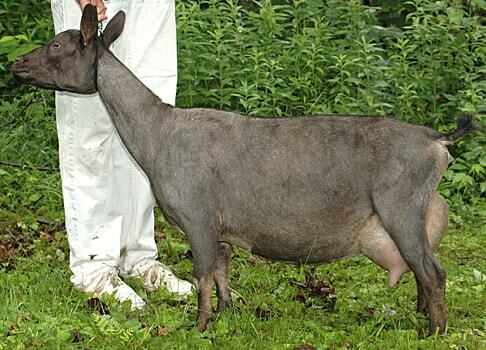 His babies will have a 50% chance of also being polled if bred to a horned doe. 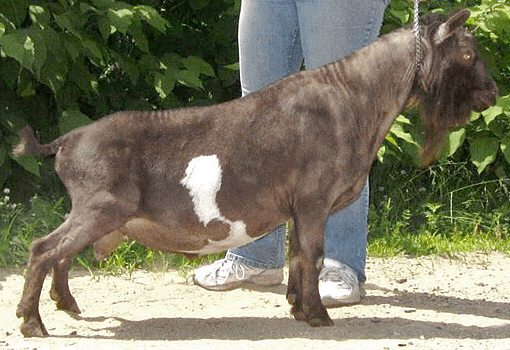 The advantage of the polled gene is that it gives the possibility of having hornless goats without disbudding. Soleil also has a very level rump, which he passes on to his kids. 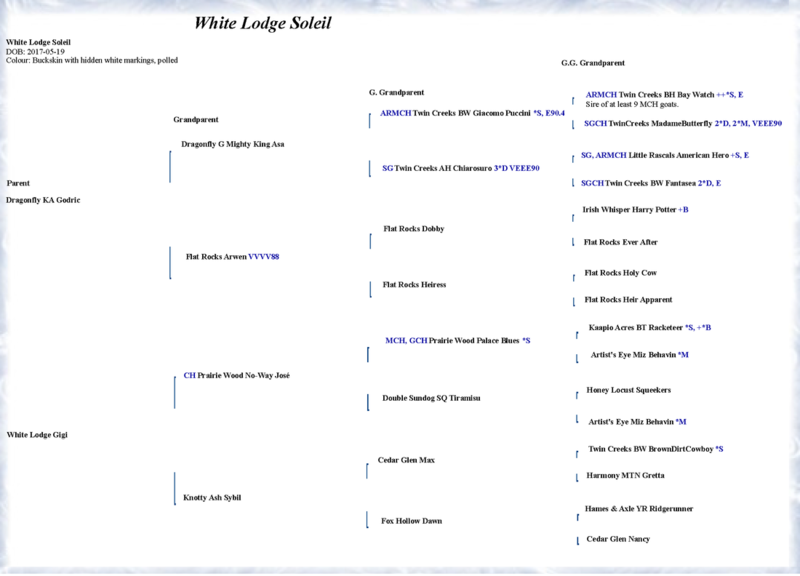 Soleil has a lovely pedigree. On the maternal side, his dam and grand-dam have not gone to shows, but his grand-sire, Prairie Wood No-Way Jose (US imported) is a Permanent Grand Champion. Soleil's great grand-sire, is a *B buck, which means that his dam earned a milk star and his sire is either a +B or also has a *M dam. 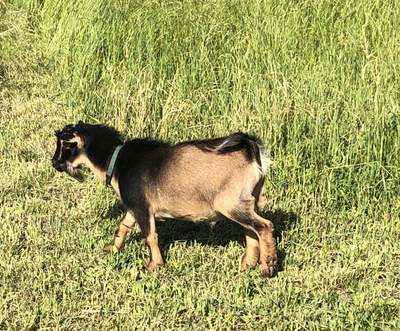 On the paternal side, his sire is Dragonfly KA Godric, a US imported buck from wonderful bloodlines. 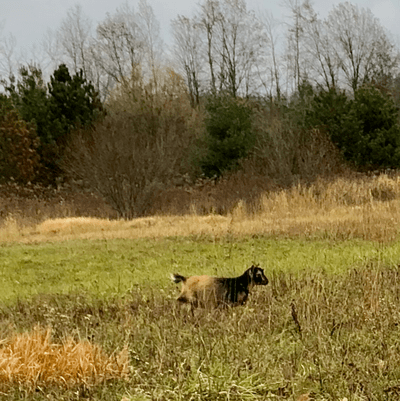 The Dragonfly herd name is well known, both in the United States and Canada, for the high producing and well conformed goats that they produce. 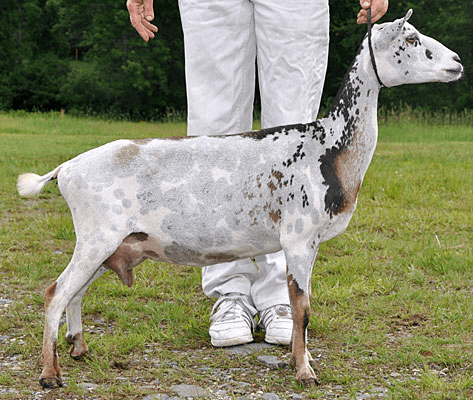 Soleil's grand-sire, Dragonfly G Mighty King Asa, won 1 Grand Champion award and 2 Reserve Grand Champion awards. He is known to pass on his level rump and great rear angulation. 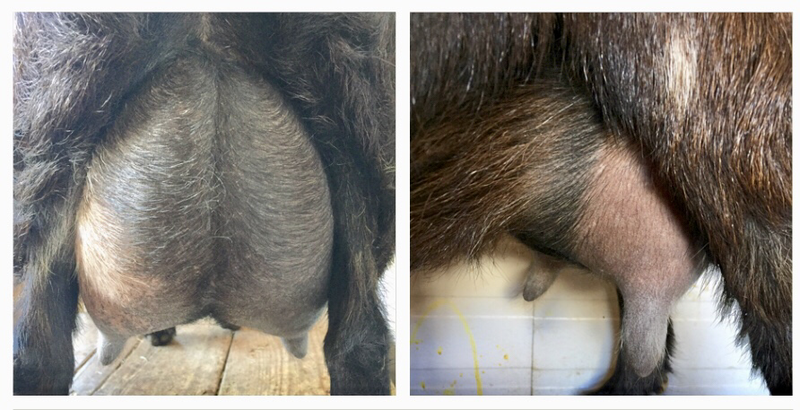 One of Soleil's half-sisters, owned by Potting Shed, freshened with a lovely udder. 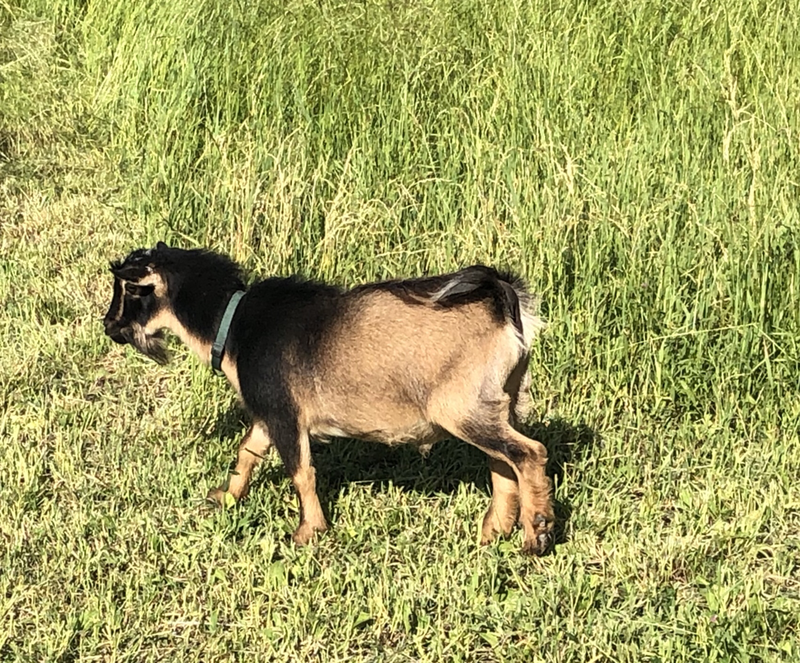 Soleil's great grand-dam, Twin Creeks AH Chiaroscuro, is from parents that are both Permanent Champions, and she herself is a Superior Genetics doe, which is awarded to a goat that is in the top 15% of the breed (she is in the 95th percentile for milk! ), as well as having her 3rd generation Milk Star and being an Advance Registry doe. She was classified at VEEE 90 and has won 1st place 4 times (out of 5 times being shown) as a junior doe, as well as Junior Grand Champion, Best of Breed, 3x 1st place as an older doe, Reserved Grand Champion, and Grand Champion. That is a lot of show wins! 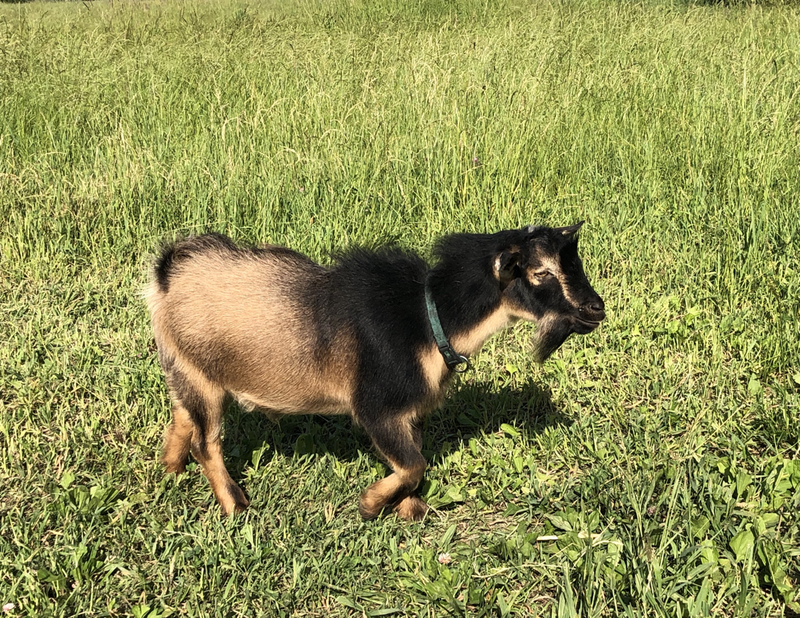 Soleil's great grand-sire is a +*B, as well as having won 1st place twelve times, 6 times Junior Champion, 3 times Grand Champion, 3 times Best of Breed (once over a two time Reserve National Champion! ), and 6 times Reserve Grand Champion.